We are experts at making you look good at your private dinner parties. From groups up to 20, we can come into your home or venue and create an experience your family and friends will remember forever! We handle all of the prep, setup, serving and cleanup for your party. How it works: We meet at your location and plan the menu and agree on all the details. Then, we plan and prep for your event and arrive a few hours before dinner time to setup and finish your meal. We offer full food and beverage service. After dinner we remove our equipment and leave your kitchen as we were never there. 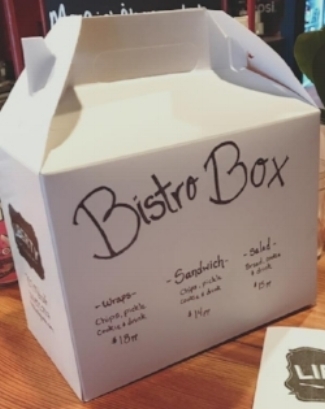 These catered lunch boxes are served with fresh baked cookie, Housemade Chips a Pickle and Bottle of Water. California Turkey, Southwest Chicken, Vegetarian and Greek Chicken served with fresh Baked Cookie, Housemade Chips, Pickle and Water. Roast Beef, Ham, Tuna, House Roasted Turkey, BLT and Vegetarian Sandwiches Available. Served with fresh Baked Cookie, Housemade Chips, Pickle and Water. California Turkey, Southwest Chicken, Tuna Spinach, Vegetarian & Caesar Salads. Served with fresh Baked Cookie, Housemade Chips, Pickle and Water. Most people just need something easy, affordable and delicious to serve to a group of colleagues, that's where these options come in. Pick and choose, scalable lunches for small to large groups. We can accommodate most food allergy & dietary requests. Serves 30-40 people and loaded with fresh vegetables, spring mix and house made croutons. We can provide you with a salad dressings, bowls and forks as well. Serves 30-40 people and loaded with fresh vegetables and flavors that compliment your occasion. Fresh Basil & Cheeses, Smoked Salmon or Avocado are just a few examples. A variety of tasty sandwiches and wraps on a tray easy to quickly feed a group of business professionals or work crews. Serves 25-50 people. We have dozens of recipes for soups like Clam Chowder, Tomato Bisque, Chili's and more all homemade and served in a kettle to keep piping hot. Serves 25-30 People - Fresh cooked and way better than bagged chips, can be made BBQ, Sour Cream and Onion or just our best selling Sea Salt. When you are planning a special event, you need a special menu and caterer. We can build our a custom menu around your event, diets, guests and attractions easily and affordably. Chef Ian's rustic but elegant style creates beautiful and memorable meals.